This colourful and nutritious dish goes excellently with a side of basmati rice with mustard seeds, a creamy dal, or fresh samosas. Heat oil in a wok or skillet over high heat. Add rice and cumin seeds. Stir-fry several seconds until rice is golden. Add cauliflower, onions, yellow pepper and ginger. Stir-fry 7 minutes or until cauliflower starts to blacken. Stir in salt, garam masala, turmeric and pepper. Add water. Cover and reduce heat to medium. 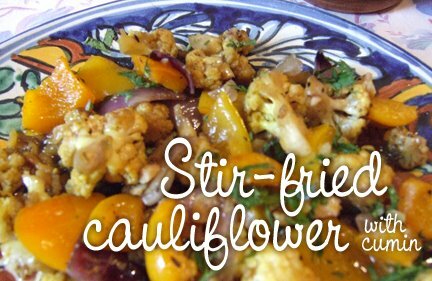 Cook 2 minutes or until cauliflower is just tender. Garnish with fresh chopped cilantro when serving. VATAS cauliflower and peppers aggravate Vatas, so best to substitute with other vegetables like parsnips, zucchini, squash or green beans. PITTAS a great Pitta recipe! Just reduce ginger and black pepper. KAPHAS a great Kapha recipe! Made this last night and it was absolutely scrumptious. Thank you for the delightful, easy change to a boring dinner.